Do you want a safe place to learn where no questions are considered out of place? 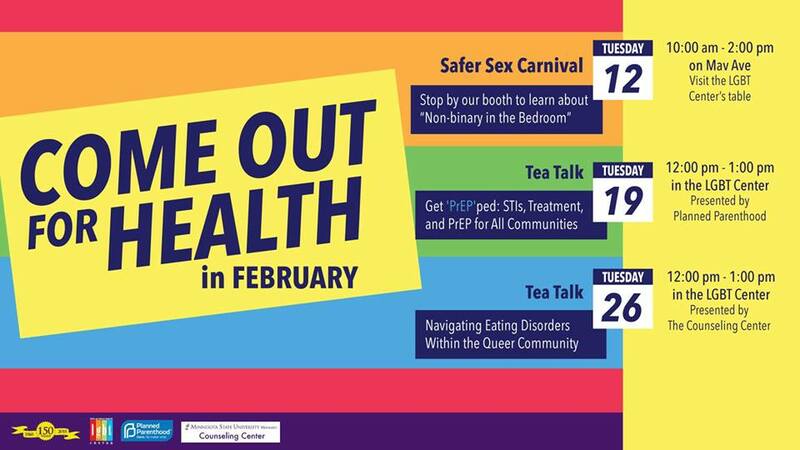 The LGBT Center is collaborating with Planned Parenthood, The Counseling Center, and Smitten Kitten to provide Tea Talks that create a learning environment for students to learn about a range of issues focusing on health and wellness. In February the LGBT Center is hosting two Tuesday Tea Talks on Feb. 19 and Feb. 26 from noon to 1 p.m. in CSU 194. Students are encouraged to ask any of the presenters their questions. The Tea Talks are a learning environment so if you came looking for an answer, ask the question! All attendees are asked to keep an open mind and are encouraged to bring a lunch since the talks take place over lunch hours. There are a range of topics that will be discussed all of which will focus on health and wellness. As always, there will be free tea! Planned Parenthood will be visiting the Center and discussing the signs, symptoms, and treatment of common STIs. They will also discuss PrEP, a pill-a-day way of preventing HIV infection. The Counseling Center will be sharing stats and infographics, discussing signs and symptoms (for self or others), and engaging students in an experiential mindfulness and a body compassion exercise. “My favorite thing about the Tea Talk topics this semester is that while the talks are held in the LGBT Center, the topics and conversations apply to ALL communities. Students from majors like counseling, psychology, health & wellness, nursing, or social work are all encouraged to join in, as well as anyone who is curious and wants to learn more about any of the topics we’re offering this semester,” said David Gardener, the acting director of the Gender and Sexuality Programs. Remember, the LGBT Center is not only for members of the queer community, their allies are always more than welcome to come in and find a sense of community. For more information, or questions check out their Facebook page at: www.facebook.com/LGBTcenterMSU.